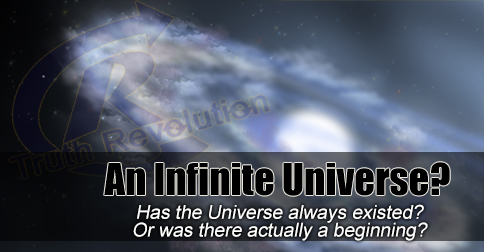 Is our Universe infinite? Not so fast! [audio:http://www.truthrevolution.tv/show/TS-0274.mp3]No Flash Support? Use this Audio Player! Dave: Has the Universe always existed? Jeff: Aside from all the scientific data to show our Universe had a beginning, simple logic should show our Universe did have a beginning. Dave: To be plain: time cannot go into the past forever. Just can’t happen. Jeff: If there was an infinite amount of time between now and the day you got married, when would you get married Dave? Dave: Well, if it was infinitely far away… I’d never get married! Jeff: It’s for a good cause. With an infinite amount of time between two points you can never get to the second point. Dave: If the universe was infinitely old, how long would it take us to get to the year we are in RIGHT NOW? Jeff: Well, the same as your wedding… it would still be infinitely far away! Dave: If the universe was infinitely old, we couldn’t be at this point in time, because we’d still be infinitely far away. Jeff: You just can’t get anywhere, if it will take you an infinite amount of time to get there. Our Universe HAD to have a beginning!